Click this link to watch the FREE BONUS VIDEO. These free golf tips videos for beginners and experienced golfers are brought to you by your friends at RotarySwing.com – the leading online golf instruction website since 2005! Hey guys. Chuck Quinton here, founder of RotarySwing.com. 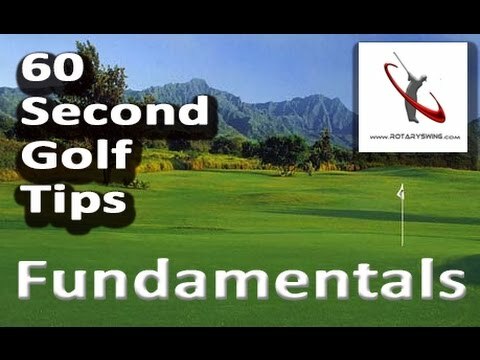 I’m going to bring to you a new series were I’m going to bring you daily golf tips, 60 second golf tips to help you understand just how easy the game really can be when you understand the Rotary Golf Swing fundamentals. The first tip I’m going to give you is actually the most important tip and that is you can’t get by on just golf tips. These golf tips, these 60 second tips that I’m going to give you aren’t just tips. They’re really going to be a quick dive into the fundamentals of what the golf swings really all about. All parts of the game, not just the swing, but the short-game, the mechanics, the mental side of the game, everything. The first fundamental that I want to give you, the first tip is about stop chasing a bunch of golf tips. Random collections of golf tips don’t work. The fact that you’re sitting here on YouTube looking at yet another golf instruction video should let you know that the path that you’re taking probably not the most effective. These tips are going to be much more guided in helping you get through all the muck that’s out there in the golf instruction world, because, trust me, there’s a ton. The first thing that you’ve got to understand is that you should always be focusing on fundamentals of your golf swing. That’s what you should be working on. If you’re just chasing a bunch of quick tips and bandaid fixes, you will always be chasing your tail around. Trust me, I’ve seen it. I’ve been teaching for over 20 years now and the guys who just constantly look for a random tip, one after the other to try and patch together all the goofy fundamentals that are messed up in their golf swing never get anywhere. They spend their whole life doing that. If you’re serious about getting better, understand what a fundamental really is. I’m going to give you a quick little briefer on what that really means. To be a fundamental, by definition, it must be primary, central, origin, and absolute. If it meets those four criteria, then by Webster’s definition, it can be a fundamental. Most things that golfers work on in the golf swing are the actual antithesis of what a fundamental is. One of the things that I like to talk about a lot is swing plane. Swing plane is an incredibly important part of the golf swing. If you think about those four criteria I gave you for being a fundamental, by definition, it simply can’t be, because it’s happening in the periphery and it’s completely dependent on what you do with your body. That is really the essence of what this tips all about. If you’re going to focus on the fundamentals and you really want to get better in your golf swing, you focus on what your body’s doing not what the club is doing, because the club by itself can’t move. You move the club. If this makes sense to you and you want to deep dive into the fundamentals and what a fundamental really is, then I want you to take a look at this bonus video I’ve got. Click the link in the description or the one you see on the screen now. I’m going to take you to a great premium video that we have on the site and give it to you for free. I want you to watch it, because it’s going to really help you understand just how to really focus on fundamentals and get through all the minutia that’s in the golf world because there’s way too much of it. Take a look at the video. If you like this video, click like down below. If you’ve got a golf tip that you’d like to see, leave it in the comments below. We’ll make sure we make a video for it just for you.